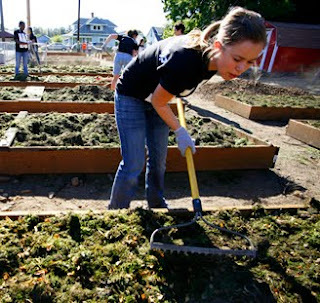 Carrying on a tradition started by Whitworth students more than a century ago, Whitworth students, faculty and staff will volunteer on Sept. 21 at various nonprofit organizations across Spokane. And this year, new Whitworth President Beck A. Taylor and his wife, Julie, will participate in their first Community Building Day. Community Building Day is an annual Whitworth event that initially began as a campus-beautification endeavor, but has evolved into a partnership between local nonprofit organizations and Whitworth volunteers who work on clean-up and improvement projects throughout Spokane. More than 1,000 volunteers are expected to participate this year, making the 2010 Community Building Day the largest in Whitworth's history. "Through Community Building Day we seek to foster both student development and community development," says Steve LaPointe, assistant director for service-learning and community engagement at Whitworth. "This is a great way to connect with the community and show we care, and to partner with agencies that are doing great work in Spokane." Community Building Day will take place Tuesday, Sept. 21, from 8:30 a.m.-11:30 a.m. After working in the community, volunteers will gather outside the Hixson Union Building on campus for a barbecue lunch. President Beck Taylor and state Rep. Kevin Parker, a 1996 Whitworth alum, will speak to participants at 12:30 p.m. to conclude the event. Whitworth volunteers will work at 36 sites throughout Spokane. Beck and Julie Taylor will serve alongside 40 other volunteers who will help Odyssey World International Education Services with its "Caring Clothes Closets" event, to be held in the East Central Community Center gym, which will provide gently used clothing to people in need. At the Boys and Girls Club of Spokane, roughly 80 volunteers will help with weeding, painting and general cleaning. Volunteers will work at various sites for Catholic Charities Spokane, including St. Margaret's Shelter, the Cathedral Plaza Apartments, the Fahy West Apartments, the Summit View Apartments, and St. Anne's Family Center. About 20 volunteers will do graffiti cleanup in the West Central neighborhood for the Spokane C.O.P.S. West substation. At CenterPointe, roughly 40 volunteers will work on arts and crafts projects with developmentally disabled adults. Volunteers also will canvass neighborhoods in northwest Spokane to find homeowners interested in energy-efficient retrofitting provided by Sustainable Works. Other sites will include Camp Dart-Lo, Cat Tales Zoological Park, Christ Kitchen, City Gate, Corbin Senior Activity Center, Cup of Cool Water, Goodwill Industries, Habitat for Humanity, Interplayers Professional Theater, Lilac Services for the Blind, Market Street Market, Off Broadway Family Outreach, Our Place Community Ministries, Project Hope – Riverfront Farms, Ronald McDonald House, Second Harvest, Spokane Guilds School & Neuromuscular Center, Union Gospel Mission, YMCA of the Inland Northwest, and SpokAnimal C.A.R.E., among others. Trista VanBerkum, SERVE coordinator, Whitworth University, (509) 777-4553 or serve@whitworth.edu.